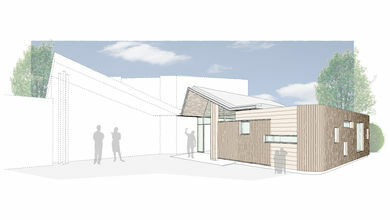 Sjölander da Cruz Architects were commissioned by Tamworth Borough Council, Partnership and Community Development Department to work with the local young people in Amington near Tamworth to design a new youth shelter, located on a previously disused area of wasteland that had been developed over a number of years to provide a habitat for wildlife and encourage rare species, acting as an education resource for the local young people and wider community. 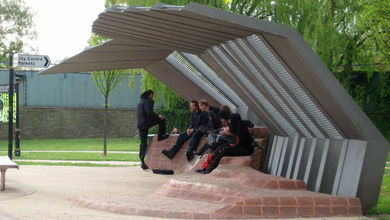 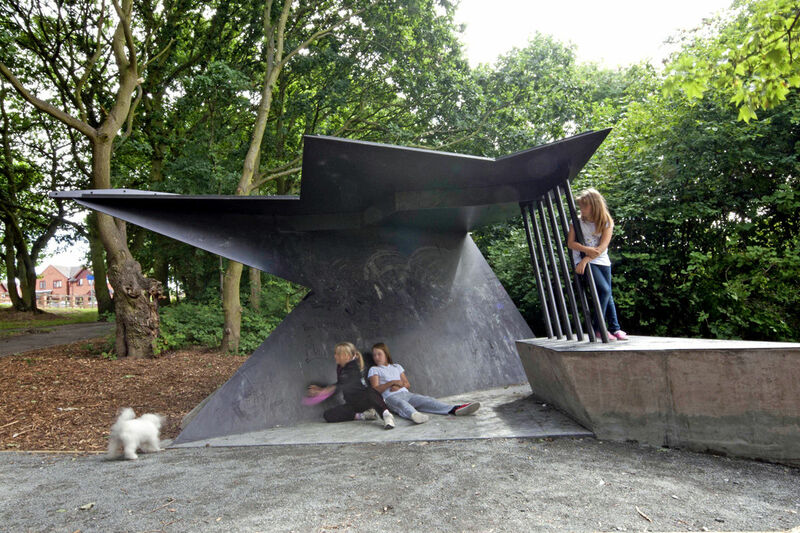 The resulting form is derived from that of a maple leaf that has been carefully folded in response to its site in order to create and define shelter and enclosure, the dynamic angular roof structure folds down and around to form the rear wall and base of the structure and then folds up again, wrapping around an angled concrete base to create the opportunity to sit down and relax. 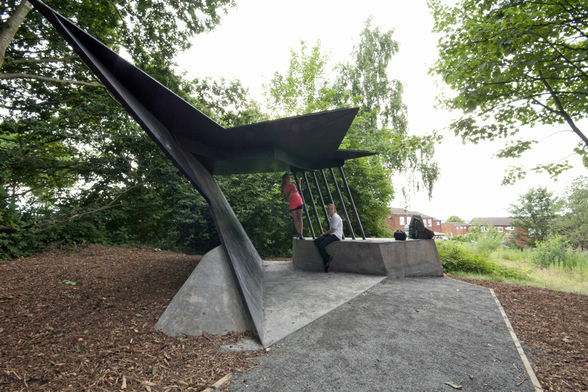 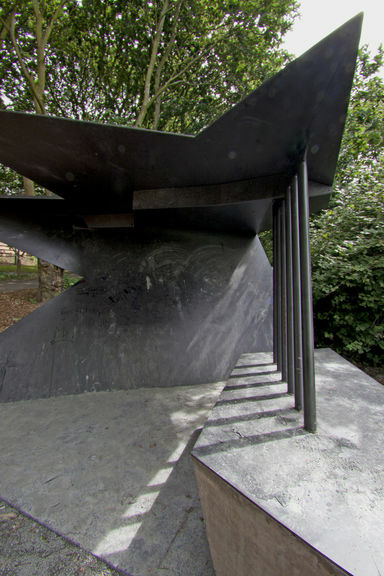 The dynamic form was translated from a 3D form to 2D drawings to enable a fabricator to form each of the bespoke steel plates, which were assembled in the workshop and then transported to site and fixed to in situ cast concrete base. 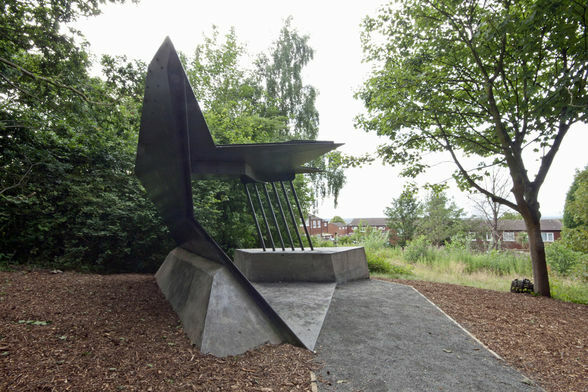 The setting out and spacing of the shelter was carefully considered to respond to both the formal and informal routes around the site with glimpses and framed views of the shelter possible through clearings in the surrounding woodland and also to provide security with clear views into the shelter maintained to prevent anti social behaviour. 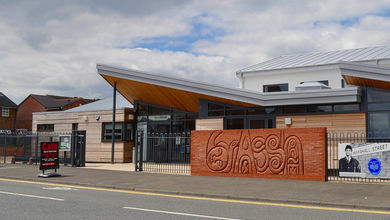 The project was realised on a very challenging budget of £35,000.00 and the design and use of materials was carefully managed from the outset to ensure the budget did not increase.